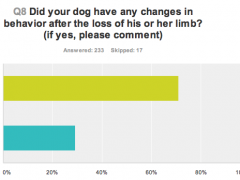 Take the Tripawd Phantom Limb Pain Survey for post-operative amputee dogs and cats. 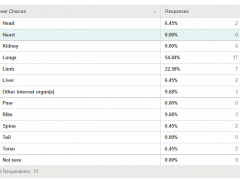 Tripawds community dog and cat cancer metastasis survey sheds insight on location, treatment and survival rates for osteosarcoma, hemangiosarcoma, histiocytic sarcoma and other pet cancers affecting limbs. UK vet study examines post-amputation pain relief and behavioral changes of Tripawd amputee dogs. 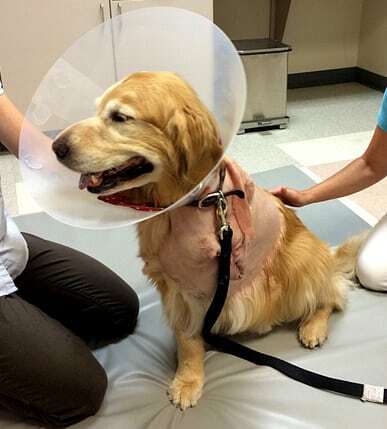 Canine, feline amputee quality of life study reveals post-op health, condition, fitness, lifestyle and pet parent feelings and experiences about their three-legged Tripawd cats and dogs.